It's Golden State vs Cleveland. Steph vs LeBron. And you can watch it all. Well we can't say that we didn't see it coming. Steph Curry's all conquering Golden State Warriors have flown into a three game advantage against LeBron James's proverbial one-man Cleveland Cavaliers franchise. We hoped it would be more competitive, but the 2018 NBA Finals could be over very soon. And you can live stream the concluding games from wherever you live in the world. The Warriors are hot favorites to defeat the Cavs over the seven game series. The games take place at 7pm ET, 10PM PT (that's 2am BST for the Brits). This is the fourth time in a row that the Warriors have met the Cavs and the Warriors pretty much walked the encounter in 2017, with a 4-1 series victory. But this is LeBron's eighth straight visit to the NBA Finals, and he'll be determined to take home his fourth championship and second for the Cavs. Calling the Cavs a one man team is perhaps unfair, but then LeBron is one of the very finest players to ever pick up a basketball. Whether you’re rooting for the Warriros or the Cavs, we'll show you how to tune into all the action either on your TV or online. If there is no local option to watch the 2018 NBA Finals in your country, don’t worry as we’ll walk you through the steps needed to watch the event from anywhere in the world. Keep reading to see how you can stream the 2018 NBA Finals live online. 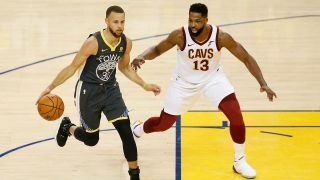 If you live in the US and have a cable subscription, then you’re in luck as ABC will be showing all of the games in the NBA Finals. However, if you want to stream the Finals online without signing up for a cable package then you’re best bet is to use NBA League Pass with a VPN. If you have the Pass but there is an NBA blackout where you are, then you can use a VPN to change your IP address to one in another country you'll be able to stream the game online. Keep reading and we’ll show you how. If there is no local option to watch the NBA Finals in your country then your best bet to catch the Warriors vs Cavs is with a VPN. By using a VPN, you can change the IP address to one in a different country which does have a stream so that you can watch the NBA Finals from anywhere in the world. Simply open the VPN app, hit 'choose location' and select the appropriate location - it's super easy to do. Choose any country (besides the US states where the game is blacked out) to stream the 2018 NBA Finals on NBA.com (use the link below). With NBA League Pass you'll be able to watch every game this season including the postseason games and the finals. The service works on your laptop, computer, Chromecast, Xbox, Playstation, Apple TV, Roku and more! A VPN will enable you to watch the 2018 NBA Finals from literally anywhere. So that obviously includes: Mexico, Sweden, Israel, Portugal, Brazil, Russia, China, Denmark, Brazil, Japan, China, France, Ireland, Germany, Netherlands, Spain, Canada, Romania and more! With SlingTV’s $20-per-month Sling Orange package you get 30-plus channels, including ABC which will show the games. SlingTV will also give you access to TNT which will be broadcasting the NBA playoffs as well. Sling TV is compatible with Apple TV, Roku, Xbox One, Chromecast as well as lots of other devices and its easy to get started with a 7-day free trial. DirectTV Now offers many of the same channels as SlingTV and Playstation Vue including ABC, TNT, ESPN and ESPN2 but it’s Just Right package also includes ESPNews as well as access to 80 other channels. If you want a lot of content to choose from and don’t mind watching the games live as the service doesn’t include cloud DVR, then DIRECTV NOW’s 7-day trial will let you test out the platform. YouTube TV is a great option for NBA fans as it includes NBATV along with TNT, ABC and the three ESPN networks you need to follow all the playoff action. The service also comes with a 7-day free trial so you can test it out for yourself. Basketball fans in the UK will be able to tune into NBA Finals games on BT Sport. The network will air the Warriors vs Cavaliers at 2am BST in the early hours. Alternatively if you’re not a BT Sport subscriber, you could sign up for NBA League Pass to watch all of the action online. When it comes to streaming basketball online our first choice is NBA.com. With the NBA League Pass you you can watch hundreds of Live and On-Demand games on all of your favorite streaming devices including Apple TV, Chromecast, Roku, Amazon Fire TV, Xbox, Playstation and even on mobile.